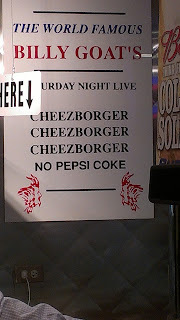 Thoughts from a Traveling Tech: Cheeburger, Cheeburger! Recently, as I was returning from Orlando I had the opportunity to fly through Chicago's O'Hare Airport. Since we had left Orlando quite early we (I was traveling with others from the office) were all ready to catch a bite. As we were gathering the vittles I noticed the sign pictured here. 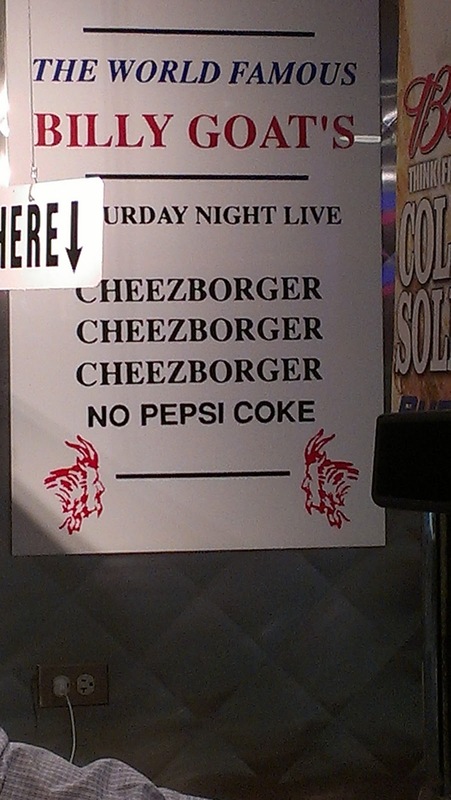 We were eating at the same restaurant made famous by the skit in Saturday Night Live. Different name, but inspired by Billy Goats. I saw this and just had to laugh as I fondly remembered the skit and the hilarity the cast brought to us. Although the skit said "No Coke, Pepsi." You must go to the original Billy Goats under Michigan Ave. It is named for the goat that was refused entrance to Wiggle and caused the curse.